Despite a campaign hit by scandals and even a police investigation, billionaire business mogul Andrej Babiš’s party remains on track to win the Czech Republic’s upcoming Oct. 20 – 21 general election, with Babiš as the possible next prime minister. But Babiš’s candidacy has raised significant concerns about media freedom and independent journalism in the country. Babiš, who made his fortune in the chemical, agriculture and food processing industries, set up his own political party in 2011 and became the country’s finance minister in 2014. He also greatly expanded his interests in the media business in recent years. Most prominently, his acquisition of MAFRA, publisher of some of the Czech Republic’s most influential newspapers and news websites, dramatically changed the country’s media landscape. Troublingly, evidence suggests that Babiš has already tried to influence the coverage of the media houses he owns in order to further his political agenda. That evidence came in the form of an audio recording of a conversation that Babiš had with a MAFRA employee, Marek Pribil, that was leaked to the public this past May. On the recording, Pribil can be heard proposing the publication of various news items damaging to Babiš’s political rivals. Babiš is then heard deciding what items to put aside, and which to publish “next year” or “before the election”. The audio appeared on an anonymous Twitter account linked to unknown opponents of Babiš. The latter condemned the publication of the recording, but has never clearly denied its authenticity. Pribil has also never issued a categorical denial. Some reports have even suggested that it was Pribil who made the recording on his mobile phone and then passed it on to a murky group of current and former police officers as part of an information trade. Although Pribil was fired from MAFRA before the summer, the recording emerged as a smoking gun in a debate that dates back to Babiš’s acquisition of the company in June 2013 and that centres on Babiš’s motives and intentions in the media business. MAFRA, which was previously owned by the German publisher RBVG, publishes – among its various newspapers and news websites – MF DNES, the Czech Republic’s best-selling quality newspaper and previously its most influential. MF DNES had become well-known for investigative pieces that set the political agenda. Stories published by the paper had contributed to the resignation of the country’s prime minister in 2005 and of various ministers and other politicians throughout the 2000s and early 2010s. 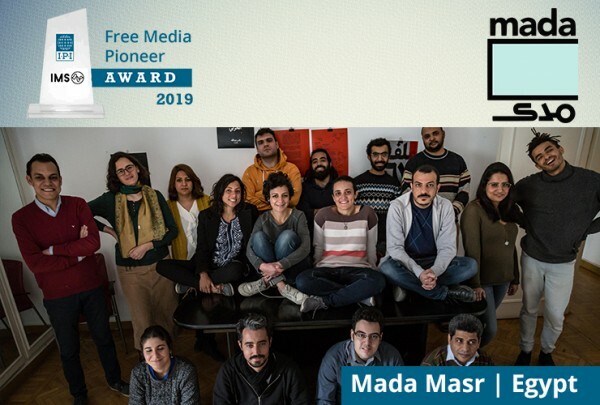 Notably, MAFRA also publishes iDNES.cz, a news website linked to MF DNES that had become a powerful player in the Czech internet market and one of the most visited websites in the country. Suspicion that Babiš bought the company due to MS DNES’s investigative department and to the broader influence of both the paper and its sister website – rather than simply due to business calculations – arose immediately after the acquisition was announced. Indeed, if one sifts through the facts and statements surrounding the takeover, today it seems more likely than not that those suspicions were correct. On June 26, 2013 – the day the takeover was publicly announced – a Babiš spokesman tried to assure the public that there was no intention to interfere with editorial independence at MAFRA’s publications. However, hours after the announcement, Babiš phoned a reporter working for one of the newly acquired outlets, Lidove noviny, to ask why the paper had not reported on a press conference held by Babiš’s political party, ANO. “I hope the guys know who they are dealing with. Obviously, they don’t,” Babiš ominously told the reporter, who recorded the call on his mobile phone. On June 27, Babiš made a hastily arranged visit to two newsrooms within the MAFRA group to try to calm the atmosphere and convince the staff that he would not meddle in reporting. Faced with questions and objections from key MF DNES journalists who had gathered in a conference room, Babiš argued that his motives for the takeover were purely business-related. He repeated what he had said several days earlier: he was merely planning to build up “the Czech Republic’s biggest media company”. However, when asked what he thought about the downsides of the media business, which had become less profitable in the age of the Internet, Babiš offered only vague and ambiguous answers. It has never been publicly revealed how much Babiš’s company, Agrofert, paid for MAFRA. The most credible reports place the figure at 2.4 billion Czech crowns (currently worth about 92 million euros), excluding the cost of the Prague office building where the newsrooms are located. What is clear, however is that MAFRA’s financial performance had been steadily declining since the financial crisis. In 2011, the company reported a profit of 88 million crowns (3.4 million euros) with total revenues of 2.7 billion crowns (104 million euros). By contrast, in 2007 – before the crisis – profit was 304 million crowns (12 million euros) and total revenue 3.3 billion crowns (127 million euros). After Babiš assumed ownership, profit rose to 137 million crowns (5.3 million euros) and 236 million crowns (9.1 millions euros) in 2015 and 2016, respectively. Total revenue during this period remained low (an unknown portion of the revenue, it should be noted, has come from ads purchased by other companies that form part of the Agrofert conglomerate). The rate of return on Babiš’s investment does not appear – at least for the time being – particularly impressive if his motives for the acquisition were purely business-related. 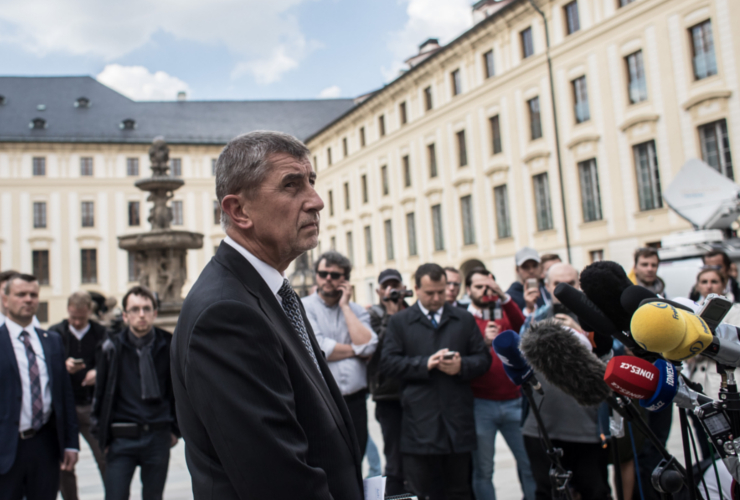 Andrej Babiš has been compared to Silvio Berlusconi or Donald Trump, and although parallels exist, it would be more exact to say that he is a Central European version of those men. Before the fall of communism in Czechoslovakia, Babiš, who was born in what is now Slovakia, was a member of the Communist Party and worked for a state-owned foreign trade company that sent him to its Morocco office. His name also appeared in the registry of Czechoslovak secret police agents. Babiš later challenged that record in court; he initially prevailed, but last week Slovaka’s constitutional court sent the case back to a lower court. After moving to the Czech Republic in the 1990s following the dissolution of Czechoslovakia, Babiš built up the company Agrofert and made his fortune in the petrochemical, agriculture and food processing industries. At the time, he enjoyed the support of Social Democratic-led governments in the Czech Republic. As the Social Democrats experienced a decline in power and centre-right parties became dominant in government, Babiš in 2011 established his own party, ANO (Akce nespokojených občanů – Action of Dissatisfied Citizens). Babiš has presented ANO as neither right-wing nor left-wing, and has strongly criticised traditional politicians as incapable and corrupt. In 2013, Babiš purchased the powerful media company MAFRA (see article). In the same year, his party finished second in the general election. In 2014, he was appointed finance minister, but was forced to resign the position this past May due a scandal involving Agrofert’s tax practices. With an estimated net worth of 3.4 billion dollars (around 2.9 billion euros) – a figure comparable to that of U.S. President Donald Trump – Babis is currently listed by Forbes as the second-richest person in the Czech Republic. Numerous MAFRA journalists did not buy Babiš’s assurances of editorial independence. Waves of resignations followed in the months after the acquisition. Among those who left were the editors-in-chief of both of the group’s daily newspapers, MF DNES and Lidove noviny. Babiš’s purchase also made him a centre of media attention. Other outlets regularly interviewed him on his plans regarding MAFRA. In October 2013, Babiš led his political party, ANO, into general elections on an anti-corruption and anti-establishment platform. The party did surprisingly well. Shortly afterward, ANO became part of a newly formed coalition government and Babiš assumed the post of finance minister. Meanwhile, back at MAFRA, the new management set about appointing new editors-in-chief at the company’s publications. Sabina Slonkova, a well-known investigative reporter, took the helm at MF DNES, but resigned in June 2014 after just several months. Almost a year later, Slonkova spoke out about her decision to leave, pointing to disagreements between her and the corporate management. During this time, Babiš, now finance minster, started to offer shifting explanations for his purchase of MAFRA. “My motives were my experience that the papers wrote lies about me,” he said in an October 2014 interview, in which he also stated that he had not expected the negative reactions that followed the takeover. “I didn’t think it through,” he commented, before musing that perhaps he should have bought a different Czech media company. Many of the journalists who left MAFRA after its acquisition by Babiš went on to work for newly established media organisations. One former editor-in-chief set up a news and opinion website called Echo24; another established the investigative, in-depth magazine Reporter. The audience of these new outlets has been growing, but their influence still cannot be compared to the power of publications owned by Babiš’s MAFRA, particularly iDNES.cz. But that is not the only difference between them. The Babiš-owned outlets have never published original investigations into Babiš’s business history, even though Babiš has plenty of skeletons in his closet. These skeletons range from suspected tax evasion to a scandal involving money from a European subsidy fund officially aimed at supporting small and medium businesses but that nevertheless ended up at a business set up by Babiš, whose net worth is estimated at more than three billion euros. The fact that such a wealthy entrepreneur-turned-politician entered the media business has had an additional significant consequence. Prior to 2013, most Czech media organisations were owned by foreign companies. But Babiš’s purchase of MAFRA appeared to spark the imaginations of other millionaires and billionaires, triggering a process of “oligarchisation” of the country’s media. Rich businessmen in the region began competing to own their own media outlet. One of them, Marek Dospiva, the co-founder of Penta, an investment company active primarily in Central Europe, did little to hide his motives while negotiating a media acquisition in 2014. A year later, as Dospiva was buying up a chain of Czech regional newspapers, he was even more explicit. He compared media ownership to a “nuclear weapon” that serves as a deterrent. “The fact that we own a media organisation makes us safe in the sense that it will be worse for anyone to irrationally attack us,” he said. These changes in the country´s media landscape finally started to raise alarm abroad. Several stories about Babiš’s power, ambition, and media holdings have been published in the Western press. Screen shot of the website iDNES.cz, owned by the MAFRA group, on Oct. 17, 2017. Did this awakening come too late? 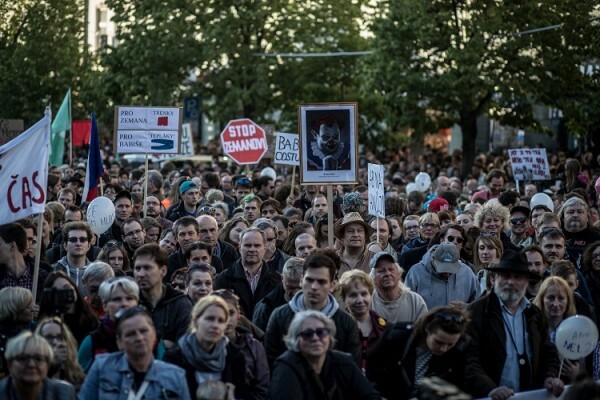 In 2016, Czech lawmakers from various political parties – excluding Babiš’s party – pushed through an amendment to the country’s conflict-of-interest legislation to, among other things, forbid members of the central government from owning media outlets. The amendment forced Babiš to formally relinquish ownership of his media companies by placing them in a trust. The trustees, however, happen to be Babiš’s lawyer, his long-term manager, and his wife. In May 2017, several months after the legal changes, the aforementioned audio recording – in which Babiš discussed what information on his political opponents should be published – appeared. The audio, which appears to have been recorded sometime in 2015, did not have an immediate impact on support for Babiš’s party, at least according to opinion polls. ANO continued to lead all other parties with around 30 percent of expected voters. 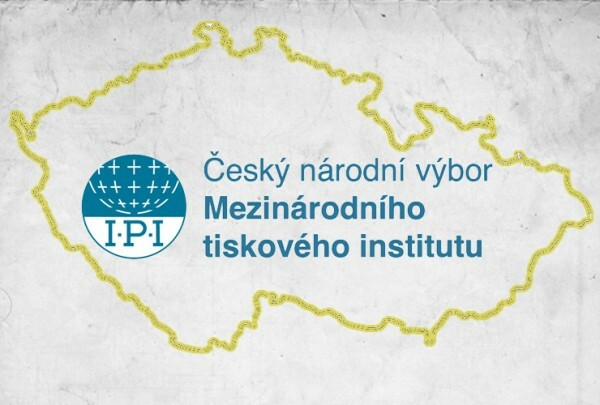 The possibility of a connection between that level of support and the Czech Republic’s new media landscape to which Babiš greatly contributed cannot be ignored. Just days before the election, Babiš is facing the biggest challenge of his political career. 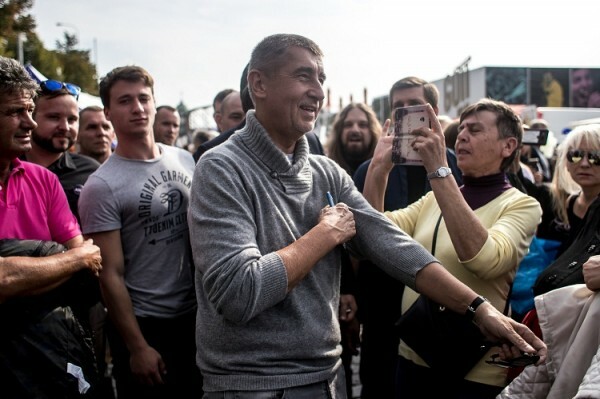 Last week, Czech police charged Babiš with subsidy fraud – one of the previously noted skeletons – and his public support seems to have dropped slightly in the latest polls. Still, he remains the frontrunner. And that begs the question: What will happen to media freedom in the Czech Republic if Babiš, media mogul, becomes prime minister? Or even if he himself declines an official position but his party – which is funded and practically owned by him – forms the government? To help answer those questions, we might look elsewhere. There exists a second audio recording being Babiš and Pribil. This time, they aren’t discussing media but rather a company Babiš disliked because it operated in the same area as one of his other firms. “Our guys took on [the company], they are in insolvency, they have frozen bank accounts now,” Babiš says on the recording. Could Babiš’s “guys” also take on the media he doesn’t like? Michal Musil is copy editor for Reporter magazine. He previously served as deputy editor-in-chief at MF DNES, and quit after Andrej Babiš bought the newspaper.